he first console role-playing game I experienced was Squaresoft's Chrono Trigger on Super Nintendo. As a title that still stands on its own today (nearly fifteen years after its intitial release), it still shapes my perception of current-gen Japanese RPG titles. Aside from graphics, very little has changed in the world of console role-playing over the course of the last decade: party sizes are usually limited; combat is often menu-driven, whether realtime or turn based; protagonists are angsty young men looking for their place in a changing world. Is there a more potent force than Mario in the console world?It takes some potent intervention to step aside from these tenets. And is there a more potent force than Mario in the console world? While Mario & Luigi: Bowser's Inside Story isn't the first role-playing experience to feature Miyamoto's mustachioed hero, it's doubtlessly the most daring and unique. Highlighting most of what makes Nintendo's DS a thrilling console (for both developers and players), Bowser's Inside Story makes players rethink what to expect from adventure games, RPGs and platformers alike. Like past Mario RPG experiences, this title is quite the genre bender. Be you new to the world of video games or an RPG veteran, there's something in this package for you. Bowser's Inside Story opens in a familiar setting — the Mushroom Kingdom has been beset by a mysterious plague of sorts, "The Blorbs," and it's down to Peach and the boys to set things straight. Before things progress too far, however, Bowser busts into Peach's castle, inhales Mario, Luigi and the entire supporting cast and disappears. What follows is one of the most unique gameplay experiences I've ever come across. are put to good use.Throughout Bowser's Inside Story players will alternate between playing Mario & Luigi (simultaneously) and Bowser. This mechanic makes use of both of the DS's screens, with the top one being Bowser's domain and the bottom one belonging to the Brothers. Environments are navigated through a simplified platforming engine, but combat takes place in a traditional RPG space with turn-based battles. Players will have to alternate between the top and bottom screens frequently — as Bowser navigates the overworld, Mario and Luigi will be busily working inside the big brute, jogging his memory and activating special powers and abilities. Like past Mario RPG's, Bowser's Inside Story brings that usual Mario flair to the console role-playing arena. Potions are replaced with toadstools, magic spells are now shell throws and screw attacks. But despite the wrapper, this is still a (highly accessible) Japanese RPG. If you've ever wanted to warm up your non-gaming friends to the worlds of Final Fantasy and Star Ocean, the bite-sized battles and family friendly stylings of Bowser's Inside Story might be the perfect stepping stone. Everything about this title oozes Nintendo quality. AlphaDream, the game's developer, pulled out all the stops to make this one of the best looking experiences the DS has to offer. The story is simple enough for kids, but will still bring a smile to all but the most hardened of hearts. Perhaps the only criticism I have to offer up is that the game doesn't quite make enough use of the DS's unique control options (in particular the stylus), but this is just as well, and acts as a healthy nod to the franchise's roots. After all, the original Super Mario RPG was an SNES title. 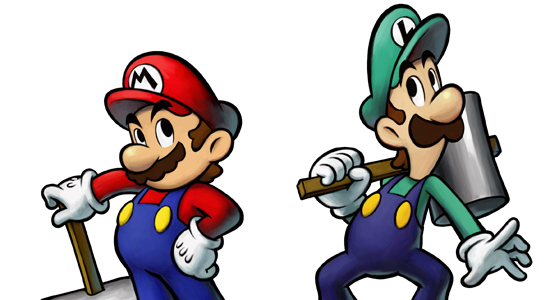 Long story short, if you own a Nintendo DS, you owe it to yourself to pick up a copy of Mario & Luigi: Bowser's Inside Story. Frequent save points and accessible play make it the perfect companion for that morning commute or cross-country flight. Add to that familiar characters, outstanding presentation and a hearty helping of fun, and you've got a real winner on your hands. This one doesn't disappoint.